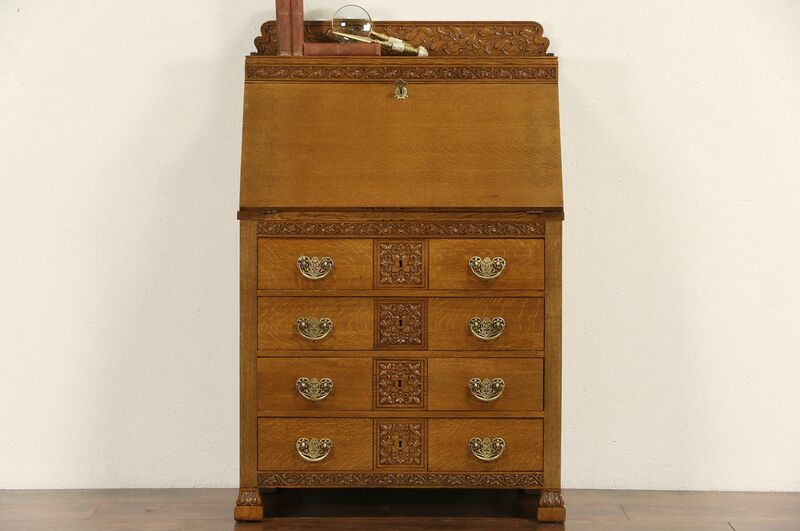 Deeply carved of quarter sawn oak about 1890, this finely detailed secretary desk has original heavy cast brass hardware. The restored finish is excellent on this American made antique furniture, which shows the influence of the "Esthetic Movement." Drawers have dovetailed sides. A key operates only the drop front, the interior is contrasting cherry wood with cubicles and tiny drawers for documents. There are permanent India ink stains on the bottom edge of the drop front and just below, see photos. Measurements are 24 1/2" wide, 17 1/2" deep, just over 47" tall and the writing surface is 29" high.